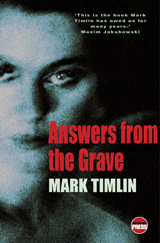 Answers from the grave spans forty years of love, life and villainy. Mark Farrow comes back to England to work for a firm run by John Jenner (his adopted Uncle). Mark is waiting for the day when Jimmy (his fathers old friend and killer) is released from prision so he can seek revenge. Our old friend Mr Nick Sharman appears in the 80’s as a bent copper earning a few quid off John Jenner. One of Mark Timlin’s best books and certainly the longest cloking in at almost 500 pages.